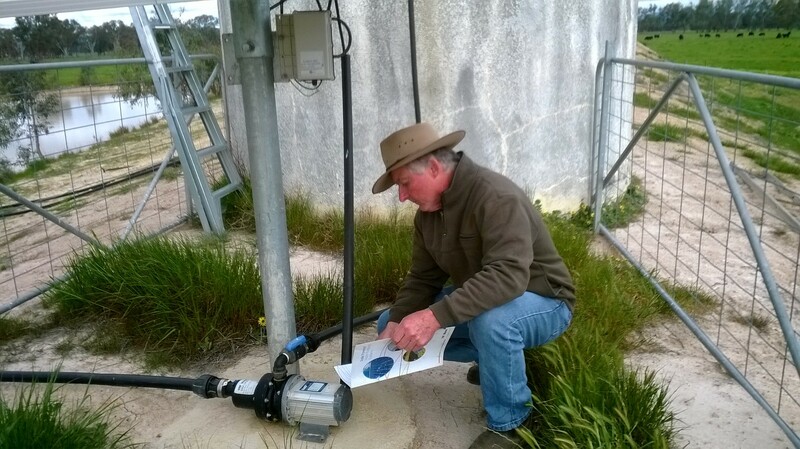 The Gecko CLaN is working with landholders to improve decision making around farm water security. A number of field days have been ran across the region in 2015. This projects uses real case studies and presents opportunities for farmers to hear about the various water requirements for stock, domestic and fire to make decisions. Demonstration on how to measure you dam depth and calculate its storage potential. More information this project and links to available resources can be found below. To effectively manage water on you property you first need to know how much water you have available and what your demand is for water over the year. Using a rope and weights system to measure the depth of a dam. The length and width can be measured with a measuring wheel or a tape measure. Once the depth is known the following formulas on the following web page can be used to calculate the volume in the dam. Once you’ve measured your dams surface area and volume, you can calculate how much water will be lost through evaporation or is unusable. Evaporation rates are approx. 2 mm/day or 730mm/year for the Goulburn Broken Catchment. To calculate the amount of water lost through evaporation: Dam surface area (m2) x 0.002 (daily evaporation rate) = X m3. Multiple this figure by 1,000 to convert the figure into litres/day. Evaporation data for your region can be found at Evaporation data. You should also remove the bottom 300 mm of dam depth in your calculations as livestock can’t access this water. Once you have calculated the amount of useable water stored in your dam you can compare this to your water requirements. Indicative water requirement for stock are seen below. For further water requirements for livestock, domestic and fire water use visit the Department of Economic Development’s website. Understanding ahead of time how much water you have in reserve will help you make decisions on stocking rates and whether you’ll need to purchase water. In developing plans for water infrastructure on your property the following information may be useful.